One of the best and oldest breweries in Birmingham. Incredible service - these folks will.kwt you sample everything. An incredible selection of IPAs. The stouts are also exquisite. Nice and big - there's plenty of room for everyone here! Good People Brewing is located across the street from Regions Field, a minor league baseball stadium. Since it was game day when I visited the brewery, it was lively inside. Good People provided a very nice vibe for its guests. Lots of space inside and out. The front and to the side they had plenty of bench seating. Also, they had some games for patrons. Once you walk inside you have some tables, bar area, taps, and you can see brewing equipment in the back. They had 10-12 beers on tap, I believe all house beers. I had four tasters of various beer styles. I thought they were well done. The servers were friendly. They don't serve food, but a food truck was parked and serving on their premises. Overall, a very nice place to enjoy beers in Birmingham. I get to Birmingham a couple of times a year for work. I have really enjoyed the positive changes in the local beer scene. I have been meaning to make it to Good Peoples for some time and this last trip I was able to get there. Located across the street from a nice minor league baseball park, I am sure this place is really hoping on game days. The whole area seems to undergoing some gentrification with new buildings, etc. As you approach, you will notice the large outdoor patio. There is also a second outdoor area that is also off the taproom. This is a nice space. There are stained concrete floors, a long bar, nice exposed metalwork, some huge fans, etc. I sat at the bar and received prompt and professional service from the bartenders. They are free with samples which is nice. They offer their beers in several sizes ranging from a small pour up to 32 oz. I thought the pint price of $6 was a fair deal. I only saw house beers, which I was ok with as most of what I had was very good. I took a crowler of IPA with me when I was leaving. They had a nice crowd. I enjoyed talking beer with several of the friendly patrons. I will have no problem making a return visit. 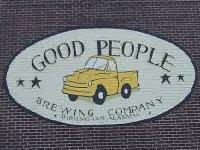 It's been awhile since I've been back to Alabama, but in my opinion Good People has the coolest vibes out of the Birmingham breweries. While I hear Ghost Train is a good time too, that wasn't open while I was living there. Always solid beers and I'd highly recommend checking them out if you haven't already. Great place to hang out during a lunch break. Good beer good people. Jana the bar tender knowledge was exceptional. She knew all the brews to the nodes taste as they changed thru temperatures.recomend a visit if in the area. V-Awesome. Local and thriving. Good combo of industrial and Alabama/southern vibes. Everyone was in good spirits, and everyone was there for a good time and good beer. They also had a delicious food truck outside. Q-Everything from the bathrooms to the seating and beer was top notch. Wonderfully set up in every single way. S- Great service, they were there right when you needed them for a refill. Selection- They have the best beer in Alabama in my opinion, they didn't dry out all night either. Brewery was very visible behind the glass., very industrial and huge for a micro brew. My favorite brewery in Bham by far. Blue Collar is its feel. Where some of the other taprooms are covered up with Gen Xer's and their registered pooches, I walked in GP one day and there was an old man who had two goats on a leash. I knew I had found the place I wanted to hang out and drink beer! Good beer and an even greater staff to take care of you! Location was near the minor league ball park. Parking available. Nice open space which connects the inside to the outside. Nice looking modern place with a nice wooden bar. I particularly liked that this drinking establishment had an area for smoking. I couldn't get a feel for the people here as I probably came around 7 pm on a Saturday at which time there were very few people. The draft list was varied but I didn't remember drinking anything that outstanding.